One of the fastest ways to enhance your blog is to conduct an SEO audit. You may think it sounds complicated, but it’s actually quite simple. Free Bonus: Download the checklist with a 21-step SEO audit (4 of them are not included in this post) and increase the traffic to your blog. In this post, I will tell you how to complete an SEO audit in just a few quick steps. Every blog owner, like in any other business, must clearly understand his or her goals. The ultimate goal, of course, is profit — at least for most bloggers. And profit directly depends on traffic and the conversion of visitors into buyers. The earlier you start thinking about creating and tracking your income funnel, the better. You should clearly understand what unique features you offer, and how you’re helping users resolve their issues. In other words, what answers are users looking for when they visit your site? If you having a hard time defining your goals, start by answering the following questions: Who is your visitor? Who is going to follow all your tips and guidelines? Write a small description of your target user. The easiest way to identify your target user is by using Google Analytics. Browse through the Audience section, and take a look at the subsections as well: Demographics, Age, Gender, Interests, Geo and others. Find out which countries the majority of your visitors are from, and their average age and gender. Make a portrait of your average user. Find out which devices readers use when they visit your blog. From the search query, users can access a search engine to your article, in which they perform a number of tasks and come across a lot of obstacles. Our task is to help people overcome those obstacles and play by the rules of SEO. To understand what stage you are at, you should measure and monitor everything as much as possible. And do not forget about your ultimate goal! Write it down, draw it and make sure to keep it in a place you’ll remember. After all, we often go astray and forget our destination. The best way to stick to your path is to visualize your ultimate goal. Divide it into stages and focus on each of them separately. Doing everything at once is simply unnecessary. This, however, is the biggest mistake of not only beginning bloggers, but of the pros as well. Chrome extensions like List Goal from Bryan Harris, designed to track the number of email subscribers to your blog, will be great assistants. You will not only see how many new subscribers you have each day, but you will also receive superb advice on how to continue gaining traffic. In this post, I’m not going to tell you how to increase your income. That is a topic for another article. I will only give you brief advice: That you must understand who your visitor is, what he wants most of all from your blog, and how to give it to him. Involve him in your funnel; encourage him to develop from a visitor into a subscriber, and consequently into a buyer. Constantly adjust your sales funnel, track the results and improve each stage. In this post, I’ll tell you how you can increase the traffic to your blog following an SEO audit. What I love about sites and blogs is that they give us indispensable friends who are always ready to help us. And these virtual friends are not in our immediate family, our own friends or our neighbors. Of course, you may get confused because of their number and purpose. Believe me, you don’t need dozens of tools in order to achieve the best results. Sign in to your Google Analytics account (or install it, although I sincerely hope you already have). Go to Behavior > Site Content > Landing Pages. Click on Sessions to sort out the results. Pay attention to the bounce rate and the amount of time the user spends on this page. Open these pages and look at them through the eyes of your user (remember your target user) or ask a friend to look through them for you. Sometimes we don’t notice even the most obvious mistakes, so an objective view may prove very helpful. Bad headings and subheadings. Most of us are scanners: We glance through the article, and if nothing grabs our attention or it is unclear, then we close the site and continue surfing the Internet. What can we do to correct our blogging mistakes? Access several of your competitors’ sites in Google (three is enough) upon the request leading to your particular page. Study them, or at the very least glance through them. The length of their posts. The amount of media content (images, videos, slides, etc.). How they wrote their headings and subheadings. How they formatted the text for readability purposes. Can you see the difference? Which page would you spend more time on? Steal the best from your competitors (I’m talking about the style in which they present their information), and adapt it to your own style. Your users will be forever grateful. Open Google Search Console and identify your least-visited pages. To do so, you will have to go to the section marked Performance. Tick Average CTR and Position. A list of all queries will load on default, sorted out by the number of clicks. You can find individual pages by going to Pages and choose the URL needed for the analysis. You can see all the keywords of any of these pages by clicking on URL and selecting Queries there. The pages that have a high number of impressions and good ranks, but a very low CTR compared to others, deserve separate attention. Look at the keywords that lead to this page from Google and open several of your competitors’ pages upon the same requests. Find out what’s the matter, and why so few people are clicking on your blog. Perhaps your Title, Meta Description, or Snippet are to be blamed. Compare yourself with your competition. Correct your mistakes — the result will certainly please you. To find out how your incoming traffic is distributed, go to Google Analytics, in the Acquisition section. Take a look at the data from the sections Channels, Source/Medium, and Referrals. If you have noticed a big difference in these showings — for example, in Bounce Rate in any source — this is your goal. This means that users are partial to your content and that they want to find out more. As soon as you determine the channels that provide the fewest visitors, you’ll have to proceed with the next step. Dig a bit deeper and examine the major sources of traffic of your 5 competitors. SimilarWeb is an amazing assistant. The free version allows you to compare 5 sites. Excellent! For example, we see that Matthew Barby’s blog attracts referrals five times more than Robbie’s blog. Conclusion: Robbie’s staff have things to work at, and there is definitely ample room for improvement. To understand what social networks focus on in your niche, you’ll need to go to a website called Buzzsumo and enter your keywords. Use all of the data you’ve received to generate a promotional strategy for your blog. Now you know the priorities! To maintain a strong blog, you need to identify both its strengths and weaknesses. We do not always write outstanding articles that collect hundreds and thousands of backlinks and sharing. In most cases, our success depends on us. On promoting that which we don’t pay enough attention to. We write articles in a flash of inspiration and hope that they will be received at their true worth. But it doesn’t happen this way. In fact, a lack of content promotion is sited as one of the top reasons behind poor reception. Just as businesses rely heavily on marketing and promotion, our articles require promotion as well. The best way to promote your articles is to make friends with the authorities in your niche. The best way to promote your articles is to make friends with the authorities in your niche. If you are a beginner, however, this may prove quite difficult. 1) Contact all the people you mention in your post. Do so via email, social networks or SMS, which is often forgotten nowadays (in case you know the phone number). 2) Send the news about your new post to all your friends and acquaintances. Simply ask them to help you out! 3) Find other blogs in Google with the help of the keywords from your article. Leave a useful comment (100-200 words) with the backlink. 4) Look for the questions in Quora that relate to your topic. Then leave a reply with the link. 5) Write about 3-4 new headlines for your articles and add them to the schedule Buffer (a free version is good enough to start) and share them with your readers on social networking accounts. Do not hesitate to share your old posts as well. If they are useful and stunning, the world must see them! 7) Open Twitter and set your keywords via the advanced search. You can also mark them in the Other > Question? section. There will be tweets that contain the question in the results. You can tweet directly or write a private message with the reply and a link to a detailed description. 8) Buzzsumo is one of the best promotional tools out there. It allows you to find the most popular articles by keywords and to see who shared a post on Twitter, and who gave backlinks to it. Sort the results out and contact those who shared posts in their tweets and gave links to competitors. Unfortunately, to be able to enjoy Buzzsumo in full, you will have to switch to a paid plan. Even the best articles can be improved! You need to know your most powerful blog posts — or those that get the most traffic. Our task is to improve them and get even more visitors. Open the Google Analytics page and sort the pages from highest attendance to lowest. You will get a list of your most visited pages. Pay special attention to Bounce Rate and Avg.Session Duration. These indicators can often be improved simply by comparing your own articles with those of your competitors. Find the key differences between yours and theirs, and consider what is effective with your competitors (title, formatting, content length, attractive headlines, media content). In today’s digital world, websites links are one of the main indicators of site credibility. This includes both internal and external links. A lot of attention is paid to external links. There is no argument that when someone else sends out a link to your blog, he is recommending your content to his users. In terms of search engines, this recommendation is a direct signal to the fact that there is useful material in your article. But the most interesting thing is that you can also sort your articles by importance. To do so, you will have to send out the internal links from other pages in the same way. If you have Top 5 articles that get a lot of traffic, the best way will be to use the links you have to them in your sidebar. That’s what nearly all the experts do (Robbie Richards, Neil Patel, Brian Dean, Ramsay Taplin). Give your top articles links with different types of anchors (exact-match, partial-match, etc.) from other pages. This analysis presents data on the external links. But let me say it again: A link is a link, regardless of whether it is external or internal. Its purpose is to help the user! Install a free version of the program Screaming Frog. (There is a version for both Windows and Mac). The opportunities are more than enough to conduct a detailed analysis of your blog. You can specify either the main page of your blog, or upload a list of all your pages. The latter is more convenient, since the free version has a scanning limit of 500 URLs. Select Mode > List from the main menu and click on the Upload List button (or simply specify the home page if you want to analyze not only HTML pages, but also images and other files), and load the list of required URLs for the audit. This tool will help with Response Codes, Page Titles, Meta Description, H1, H2, Images, Inlinks (and anchors), Outlinks, SERP Snippet (Desktop, Mobile and Tablet) and many other technical aspects of SEO. You can check what your pages look like in Google search results. In the lower block, simply browse to the tab SERP Snippet. This tool will show you all the defects you’ll need to correct. You will improve the look of your blog not only in the eyes of search engines, but also in the eyes of your users. Every article needs keywords. In fact, your site traffic depends on how you well you’ve researched your keywords for each post. But if you didn’t pay as much attention to this as you should have, it’s not a big deal. Every mistake can be corrected. This step can be carried out when you really have something to add to the article. And this information should be useful for the reader. You shouldn’t just write parts of the text for the sake of adding new keywords. Playing these sorts of games with Google is quite dangerous. You have a wonderful blog post, but your site traffic is low. You found it in Google Analytics, and now you want to give it some more power. Let’s see the keywords, for which some traffic already exists (Search Console), and then choose some seed keywords. (3-4 keywords will be enough). I love selecting keywords with the help of KWfinder and KeywordTool.io. KWFinder lets you find long-tail keywords with low SEO competition. Type your seed keyword and press Find keywords. Repeat this action with one keyword after another, and save the results. For this purpose, highlight all the phrases, press Selected add to the list, select Add to a new list, and then click the Add to List button. You will see the table with the search results of relevant phrases, and the interest to this phrase with the course of time (excellent information to understand the trend of the phrase). If you click on any of the phrases, the information from Google SERP will appear on the right, with the main indexes (Domain authority, Links, Facebook shares, Estimated visits per month) regarding those who are on top. The phrase in the KD column has the value of difficulty of getting on top. These are very useful data for assessing your possibilities. Of course, if your blog is already up there with the pros, then you can fight for high-frequency keywords. And if you are a beginner, it’s better to choose phrases of lower value. The free version is enough to analyze 3-5 phrases a day. Make sure to choose low competition keywords. Keywordtool is also a great way to search Google keyword suggestions. You can also search the requests on YouTube, Bing and in the App Store. I really like that you can immediately get the variants of users’ questions in the results. In order to do so, you should choose the tab Questions. That’s all there is to it! You just need to copy all the results and see the average monthly searches on Google Keyword Planner. Choose the most suitable searches for your topic keywords. Check all the keywords that you got in such a way and leave those keywords that have less competition (DA and PA values of competitors are the lowest.) These are our target keywords. Write at least 100-150 words to describe each phrase. Download this step-by-step checklist to perform your own SEO audit. Recently I’ve learnt about a new tool which can become an indispensable assistant of any SEO-expert or blogger. I’ll tell you only about one of its features. Very often we do not know what to write our new articles about. Sometimes we have a lot of ideas. Sometimes we experience writers’ mental block. In both cases, Serpstat will be able to help you. No doubts, you know your competitors. Perhaps you even have a prepared list you sometimes refer to so as to find out what’s the news with your rivals. After all, who is aware is forearmed! About the search of new ideas for your blog posts with a prepared set of keywords (relevant, synonyms, LSI, and so on). Simply enter the URL of your competitor on the home page of this service. Next, scroll down a bit to the bottom and find the area “PAGES WITH THE HIGHEST VISIBILITY”. Thus, you will find out which of your competitors’ pages are the most popular and are likely to bring them the most visitors. Click on any of these pages of your competitor and find out on which keywords he gets organic search traffic. You have a new idea for your article + a ready-made set of keywords and relevant phrases to be used. Switch to Google Search Console account to Crawl > Crawl Errors. If there are errors, correct them. In most cases, these are nonexistent pages with the 404 error. Correct the URLs of these pages or place redirects for the necessary information. The 404 page is very important for you. That’s where the visitor gets once he or she inserts incorrect information or follows the wrong link to your blog. Add a powerful CTA not only to avoid losing the user, but also to get him or her more involved — for example, to transform the user into an email subscriber. Look what a wonderful 404 page Bryan Harris has. To search HTML advice from Google itself, go to Search Appearance > HTML Improvements. Here you can find all your duplicated Titles and problems with Meta Descriptions. Also, you can find duplicates of your pages here, since they are likely to have the same Title. Just click Duplicate title tags and you will get a list of all such pages. A good way to correct your mistakes is by indicating the tag canonical as a means of showing the search system which page is the main one. Another excellent and free tool is the Online Broken Link Checker. It helps find broken links on your pages and other sites. Just enter the URL of your blog’s main page and start the error search. As a result of the check, you will get a list of broken links. By clicking on the URL in the table, you will be able to access page where the link was detected. Then all you have to do is correct or delete these broken links — that’s all! Indeed, in Robbie Richards’s post 25 List Building Strategies: From Zero to 4,476 Email Subscribers in 10 Months, there is a broken link that leads to a nonexistent page. There are both good and bad links. The easiest way to check whether you have bad backlinks is to use the OpenLinkprofiler tool. The free version is enough to see all incoming links and to detect the bad ones, which negatively influence your blog. It’s quite a useful tool, as it gives you more than enough information on backlinks (For example, turn on signal for new links). Then you need to inform Google that you no longer want it to take certain backlinks into consideration in its algorithms. For this purpose, you need to go to the disavow links tool page and upload your list of undesirable links. When you promote your articles and place links, pay special attention to anchors (the text of links). Don’t overuse the exact match of a keyword, and always think about the user first and foremost. That should become your point of departure. Make it clear to the user what he’ll find when he clicks your link and goes to your page. Google has more artificial intellect than ever before, and it does everything possible to make it impossible to manipulate. However, it doesn’t prohibit you from contacting other sites’ owners, from writing or from completing any other work regarding the growth of incoming links. If the link is natural, and if it’s on a relevant or a powerful site, it will not be harmful on the condition that its purpose is to help the user answer his questions and access additional information. No modern webmaster can do without a set of tools, although most are commercial and cost quite a bit of money. So, what should beginning bloggers do? Especially if their blogs have yet to make money. Always use the free versions of these tools! I haven’t seen programs without a trial period, or at least a limited (but free) set of functions for quite some time now. When you work with links, conduct an analysis of your competitors, or perform an audit of your blog/site, there is a wonderful tool called Semrush. If you have yet to register there, do so right now! You will discover dozens of possibilities for analysis, and you’ll get a FREE assistant to help increase your traffic. Step 12. How can Semrush help analyze your link profile? It can present you with potential new links to add to your piggybank. Semrush gives you the opportunity to compare the backlinks of up to 5 domains. For example, compare the backlinks of your blog with those of 4 competitors — and it’s all free! You will see immediately what is worth striving for. More links doesn’t necessarily translate into better links. The important thing is quality, which is why you ought to pay attention to Page Score in Semrush. Enter 5 domains and launch your comparison. You can find out what particular domains or pages give links to your competitors. You can see up to 11 links for free, which is more than enough.This way you’ll get 55 possible variants of adding the link to your wonderful post. Log in the next day and enter 5 more competitors, and so on and so forth.Find out page owners’ contact details, and send them a short message by email or on social media. Neil Patel, Brian Dean, Robbie Richards, and Peter Attia offer great email outreach templates: Use experts’ recommendations! Retweet or like their posts. The best option is to develop mutually beneficial relationships. If you are asking the owner of another blog for something (and if his blog is much more powerful than yours), you should make sure to do something in return. In the modern world, millions of new blog posts appear every day. It’s hard to be the best if all you’re focusing on is posting high-quality content. It is certainly possible in the spheres where the competition isn’t too high, but it’s not likely. So, what to do when your traffic stagnates? Look at the best and use their tactics. Take the best from the top bloggers you follow and personalize their methods. In the previous stages we found out how to look at your competitors’ backlinks and apply them to your own blog. Now I will tell you how to use others’ content for your own purposes. Step 14. How can your competitors’ content help you? Let’s imagine that you wrote a wonderful article that attracts minimal traffic. You found it via Google Analytics. You found out that users like it, as they’ve been spending quite a bit of time on it. Make a list of keywords that lead to this article from Google. And again, Google Search Console in the Search Analytics subsection will help you. Install the radio button for Queries and enter the URL of the page in question with the help of the filter in Pages. Let’s also exclude the least clicked phrases. Preferably, include no more than the 5 most important phrases. Then we’ll go to Google and enter the first keywords. We’ll open all sites with a higher position than your site and look at how they differ from your page. A new tab will load. We are interested in the number of words on the page, as well as their density. Open your competitors’ pages based on these 5 select phrases, and take note of the number of words they’ve used. In doing so, you will analyze the content length of your competitors. If the difference in the number of words is noticeable, you should add some more information to your article, explaining the questions in a more detailed way. In the SEOquake results, pay attention to the DENSITY tab. Click on it, which you can do from the context menu, by choosing Keywords density. All words with the corresponding statistics not only in the content, but also in the Title, H1, Meta Description are here. It’s very useful information when it comes to analyzing your competitors’ blog posts. Add new relevant phrases to your article, including them in the smoothest way possible. Don’t try to manipulate or play with the search systems. Add these phrases only if you have more useful information to contribute. Take care of your readers and your own security! A quick piece of advice: This same information can be used when you create a new article. Examine the materials of your competitors! What words do they use? Often, that’s the best way to choose your ideal relevant phrases and synonyms. Your competitors have already done the work, so make sure to learn from the very best! You can get the main problems and recommendations on improving page loading speed in Google Analytics. There are plenty of other options, but they require some technical preparation. That’s why if you have time for such preparation, I advise you to read the article 5 Easy Ways to Help Reduce Your Website’s Page Loading Speed. Go to the section Behavior > Site Speed > Speed Suggestions. In the end, you will get a table with your pages’ average loading speed results. Pay attention to the column PageSpeed Suggestions. You can click opposite each of your pages in the number of suggestions on improving your loading speed. It is possible to reduce server response time with the help of CDN (Content Delivery Network), or by changing hosting. Most bloggers use cheap hosting pricing plans for their blogs without renting dedicated servers. That’s why we (myself included) have to put up with slow loading speeds on the pages we visit. But this is not as important as it used to be. I would argue that the page should be loaded within a couple of seconds, as most people advise. Personally, I think that when a blog is still new, it is not necessary to spend a lot of money on a dedicated server. The opportunities offered by our pricing plans are more than enough. It is within our power to only choose the right hosting providers for us. Make sure to read the words of advice this tools offers, below on the page. You will be able to apply some of these tips on your own. One of my favorite ways of selecting a host for my projects is simply to look at my competitors. If you have a list of your competitors already prepared (and every blogger should have such a list! ), check what hosting they chose. This way you can see that my blog’s hosting is on SiteGround. Then find out the loading speed of some of your competitors’ pages in Pingdom. Choose the winner, and then pack your files, databases and get ready to move. Of course, only do so if you think that it is necessary (for example, if the loading speed indexes of your pages are far slower than those of your competitors). Images are by no means a less significant part of an SEO audit. The faster your site will load, the more satisfied your visitors and the search systems will be. Now it’s time to help your images lose some weight. When you check your pages in PageSpeed Insights, you’ll see a list of recommendations from Google regarding which images can be reduced in size. Let’s check the indexes of the post 25 List Building Strategies: From Zero to 4,476 Email Subscribers in 10 Months by Robbie Richards. As you can see on the screenshot, the general index for Desktop is 30. It’s a very low score, out of 100 possible points. And the first tip from Google is to optimize your images. Compression can help to reduce the size of your image files by 1,4MiB! In the case of a correct images optimization (the keyword in the name of the file and ALT tag, files compression), you can gain substantial traffic from search systems. Help the search machine understand the context of your page. It’ll undoubtedly become a bonus for your SEO. We use images quite often, because visual information is perceived 60,000 times faster than written information. Neil Patel recommends using visual elements once every 350 words at the very least. My analysis of his blog posts reveals that on average, Neil inserts one image for every 97 words! But high-quality photos tend to be larger in file size. Without optimizing these files, we increase the loading speed of our pages. Personally, I prefer to optimize each image manually in Photoshop (using Save for Web). That’s how I control the quality of the image while compressing it to choose the best format (gif, jpg or png). If you don’t have Photoshop, you can use plugins for WordPress and other web tools. They will help to reduce image size by up to 80%, without compromising the quality of your images. You can find a wonderful selection of 10 image optimization plugins to speed up your WordPress site here. It’s up to you, whether to use plugins, to perform optimization and image compression yourself, or to use web tools.The main thing is to remember that the quality of your images must not be compromised! Don’t forget that any plugin will slow down your blog a bit. That’s why you may want to limit your desire to solve every problem with the help of a plugin. Advice: Use the keywords (relevant or synonyms) in the name of the image file and in the ALT tag. Throughout all my career connected with the development of various websites there have been attempts of attacking these projects all the time. It seems as though nobody needs your blog and access to it. Trust me, hackers do need it! There will always be a villain who will want to harm you or take advantage of your blog. Typically it will be a virus. The purpose can be anything, so our task is to do everything possible to prevent attacks of your WordPress blog. Give special consideration to this matter. It’s better to do it at the setting stage, since almost immediately there will appear someone who will want to attack you. Normally these are automatic bots that find out about new blogs. There was an attempt of hacking my blog 2 days after I had installed it. They tried to guess the password in the admin zone. But since I have prepared for it (installed plugin Limit Login Attempts, Sucuri Security and followed plenty of other safety tips), now I only watch when someone is trying to hack me. Be sure to make backups at least once a week and always have a master version of your blog ready at hand (you must be sure that there are no viruses there). Don’t make the life of hackers easier. Even basic protection will help you avoid 99% of attacks. Performing an SEO audit is very useful for both your blog and your competitors’ analysis, in order to apply the very best to your site, and to get rid of all unnecessary things. The majority of problems you’ll encounter are technical in nature. That’s why it’s quite easy to say goodbye to them — once they’re resolved, you’ll never have to deal with them again. And, of course, you shouldn’t refuse the bonuses that an audit can offer. Don’t be lazy — analyze your blog! I hope this information will be useful, and that you’ll be able to apply it to your blog. Have you conducted an SEO audit by yourself, or have you used the services of agencies or freelancers? Or have you never performed an SEO audit? If anything remains unclear, don’t hesitate to contact me. I will answer your questions with pleasure! I’m looking forward to reading your questions and comments. Best regards, and talk to you soon! P.S. I have prepared a free SEO audit checklist for you. It contains 21 points, and can be read in just 5 minutes. Download it and apply every step to increase your traffic! Good stuff, man. I actually learned a couple things. 😀 bout to download the checklist. Thanks for a word of encouragement! I really appreciate that. I hope my article and especially the checklist will help you in the SEO audit of your blog. A lot can be improved if you conduct an audit of things which have already been done. Wow, it’s a very big article with successful step by step framework. I would like to say a few words about the analysis of competitors. Unfortunately Google’s tools are not enough. So I use tools like Serpstat and Moz for more detailed research of competitor’s keywords and ads. Yes, for the time being I get only long articles 🙂 I do my best to cover the topic as much as possible. You really need more tools to analyze the competitors. I agree with Serpstat and Moz. Ahrefs, Semrush, Buzzsumo are also great assistants. Great post and so many useful tips that you shared here. I couldn’t wait to head over to your website when I received your email. Definitely a lot of things that I want to go over slowly and see how I can apply them to my blog. I will share this on social media so that other people can read it too! Thanks for sharing this and all the best! Thank you very much for your support! I also really like your articles and I’m looking forward to new ones being published. I tried to explain in layman’s terms how much SEO audit can help. Of course, we all have very little time, but occasionally you should dedicate some time to analysis. Some of the steps in this article can be applied when analyzing the competitors. Great post, easy to read and great extra resources. Thanks, I tried very hard to make a post clear and easy to read. Concerning A / B tests, I agree 100%! And thanks for Krank.io, I have not heard about it, will have a look at it for sure! thanks nice post , I like your sharing information this SEO Audit 2016.. Thanks Sutopo. It’s much appreciated. A perfect post that indicates the your blog problems that never grow your SEO and the perfect examples to recover them! Yes, very often these are problems and errors in our blogs that can interfere with a successful SEO. It is crucial to identify and fix them in time. P.S. I tried to make the table of contents convenient! Greay mammoth post, some good tips in here and broken down in a nice easy to manage way, with some epic tools. Love kwfinder, its a winner. Im alsp writing a monster checklist for content, before pushing the publish button. Youve given me some good ideas. I tried very hard to make the post as useful as possible. Yes, I love KWfinder as well. Its interface is extremely user-friendly and you can take advantage of some useful features. I suggest making friends – subscribe to my updates and feel free to send me your new posts. I will be happy to share them with my readers on Twitter. I am very pleased to hear your cordial words, David! I try to cover the topic in as many detail as possible. These are my first articles and I hope that in the future they will turn out good as well. so many things learnt from this articles because it’s very helpful for me as well sure to be other. Thanks Chalat for the comment! I want to ask how do you rate kwfinder against long tail pro how accurate is seo difficulty score of kwfinder ? I’ve never used long tail pro, so I can’t recommend it to you. Personally I really like KWFinder to assess the complexity of promotion, all the more so as the analysis can be done and it can be done for free for several requests a day. Terrific post! Your quick tutorial on using Google Analytics and Search Console are very helpful. Although I’m acquainted with both, they can be daunting to newer folks and its nice to see someone walk through how they can be used in more depth. I also appreciate your tips on image optimization. Most folks, including me, usually talk about the importance of the Alt Image info, but leave out the rest. Good going for pointing out the other aspects including Title info. Keep it up! I subscribed so I look forward to your further tips. Thanks, Tom! I am very pleased that my tips were helpful for you. Many beginners are afraid of the word SEO, although there is nothing complicated about it there. I really hope that my guide on SEO audit will be useful for everyone. Well formatted and informative one indeed. I am bookmarking this handy check list so that I can come back and check your points again and again while doing an SEO Audit! I was trying very hard to make my manual on SEO audit as detailed and useful as possible. I’m very glad that you appreciated my work! Muhammad, I liked your blog very much! Keep on working this way. Probably you just need a bit more content in your articles. I think now i am going to conduct a SEO Audit on my blog as i am not getting the desired traffic and result. your google analytical tutorial is really helpful to me. previously i didn’t know that how to track the visitors in the site but now atleast something i know very well. Hi, I’m glad that you like it! Amazing post Michael, It has taught me a lot. I have a lot of reading to do on your website. Very valuable information. Keep up the good work. Glad you like, Kamal! Means a lot. Awesome post, Michael! Thank you SO much for all of this valuable info! Your posts are clear, detailed and full of helpful tips. I am so glad I found your site and look forward to more of your great content. Cheers! Hi, Aliyah! It’s very pleasant for me to know that you liked my post. I hope it will help you increase your traffic. If you have any audit related questions, please don’t hesitate to ask! Thanks for more ideas on how to improve, especially those in backlink topic. Thats really help! Hi Michael this is another great article. Everything you explained very clearly. But the problem for the newbies in SEO is all the important tools are not available for free and sometimes they don’t have enough money to start with. Yes, you’re absolutely right, that’s why I was trying to consider the options particularly with free versions of the tools. Michael,Really useful ways to audit site’s SEO.I have been using SEO Centro for this purpose.Is this enough for SEO ? Amazing, thanks for sharing all the tricks for a better audit of a blog. A good audit definitely helps to build your website presence in search engines. Hey, Michael great post man. It’s very helpful. It’s sure will help me in my work as am new on it, Thanks. Yes, people are constantly trying to hack my passwords, so it’s absolutely necessary to provide yourself with basic security! Nice article written by you. easy to understand and great tools list you share with us. Keep sharing awesome content. Impressive post!! So thoroughly that I don’t think there’s anything else to add. And not just for blogs, it could be perfectly applied to small and medium-sized websites. Thanks for the feedback Antonio – much appreciated! Excellent in depth article! I’ve spent a couple of minutes reading these comprehensive list and I’ve learned few new things about SEO audit. I have been doing SEO for many years however there are a lot of things I need to overlooked. I haven’t used Canonical tag in my site. Thanks for sharing this, I will be bookmarking all of these. Awesome checklist Michael, have been doing SEO audits for well over 10 years now but took away a few gems from your post. Need to use Similarweb more often now! Hi, first of all, nice article and I found that your social sharing icons are not good. My opinion makes these bigger and colorful. I have bookmarked your site, I can check it out again and again. I think, It’s a best seo audit guide ever. I will definitely follow step by step when I will audit a site. Thanks for sharing this type of great article. Thanks Matt, appreciate the kind words! Wonderful post! Some smart tips in here and weakened during a nice straightforward to manage approach, with some epic tales. Love kwfinder, it’s a winner. I’m asp writing a monster list for content, before pushing the publish button. You’ve given ME some smart ideas. I attempted to clarify in layman’s terms what the quantity SEO audit will facilitate. Of course, we tend to all have little or no time, however, sometimes you must dedicate your time to analysis. A number of the steps during this article will be applied once analyzing the competitors. Thanks! This post is huge! This is the skyscraper technique taken to another level. Well done. One of the best SEO Audit Checklist I have found, such a detailed informative Article Michael you have covered almost all the things. Thanks for posting such a nice material. Awesome post for seo audit checklist… enjoyed reading it..Please stay us informed like this. Thanks for sharing. as usual one more great post Micheal….you always give some unique information in your post…thanks for sharing this…! This is pure gold. Do you have any video course on page SEO audit or any ready made template? And how much do you think one should charge for SEO audit? Thanks for the share Michael, great article. Do you use strictly screaming frog for checking your content optimization or do you have some alternatives in your pocket? And if you, which one would you recommend? Hey Filip, only Screaming Frog. Awesome post for seo audit checklists.I enjoyed reading it. Please stay us informed like this. Thanks for sharing. 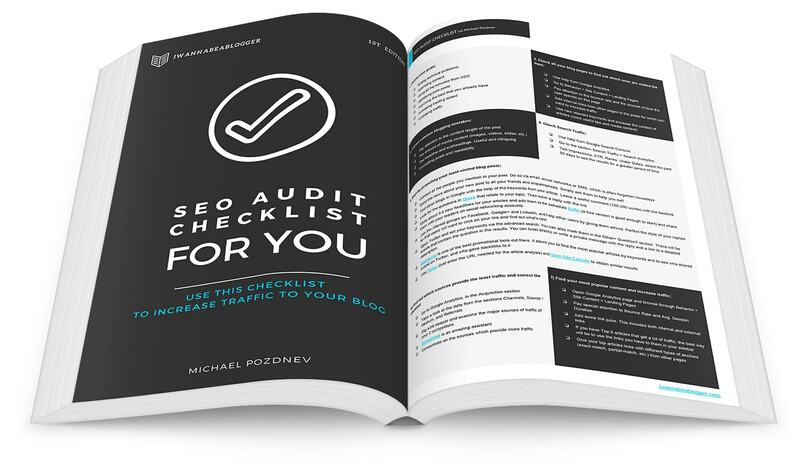 Hey Michael Pozdnev, I always love to read SEO AUdit checklist! This is one of the best checklist and SEO Audit solution indeed. I personally enjoyed this post and have solved very few onsite issues. It seems that you’re amazing and fluently popup better solution for beginners. Thanks, Shakoat! Nice to hear. Followed you on Twitter. I created a site and sit back normally because I was thinking that I will get the viewers someday. Then I come to know about the SEO part but all I knew was creating backlinks and it will help in future. But this 20 step checklist has made my day and the best part is the BuzzSumo thing. I never knew such thing ever exists. Now I can get some ideas which type of headline to use and what is getting more CTR on the social media platform. Thanks for the great information mate. Yes, there are thousands of tools that are ready to help us. Thanks for sharing the checklist and solutions for seo audit personally i use screaming frog most of the time. You are welcome, Daniel. I used it very often too. A really great helper for technical search engine optimization. That is a lot of information, but you did well to make the post easy to follow and read. And yes site security can really be improved with a couple of the simple steps you have pointed out. Security is very important these days. Make backups, and always have several versions on hand. Very nice post Michael. informative stuff.. Thank you, Paul. It’s nice to hear the praise of an SEO specialist. Great information. It’s very informative topic. Thanks! You’re welcome, Mario! This topic is vast, but I tried to dig as much as possible. You wrote an excellent focus list. I would add to it the most critical point in my opinion. Always put your reader in the first place. Help! Enjoyed the level of detail in this (good to see personas get a mention, great write up! Thanks, David! I think these details help to open the topic better and deeper. Thanks for sharing informative awesome SEO audit checklist and side by side solutions. It will be very much helpful to me for website SEO audit. I will follow your guideline sincerely. Again thanks especially Michael Pozdnev and all participants. Thanks, Kevin! Content and SEO audit is critical to conduct at least a couple of times a year. When only tiny changes can lead to an increase in traffic and revenue, it is foolish not to take advantage of this. Thank you for another masterpiece. This post took me almost an hour to read but it was worth it. SEO is still the game if one knows how to play it. In fact, it can save lots of money and bring success for years without even doing something. You have mentioned some brilliant points that I often used to miss but now I won’t do that again. Thank you for your kind words of support, Umesh! I see SEO as a skill that anyone can learn. Unfortunately, many marketers have created a misconception about SEO, and many bloggers do not use its capabilities at all. Because they think it is difficult. Because it is too technical, but it is not. SEO brings long-lasting results. This is the foundation for getting subscribers and new customers every day for free. PS Thanks to you, this is my 1000th blog comment. WOW!